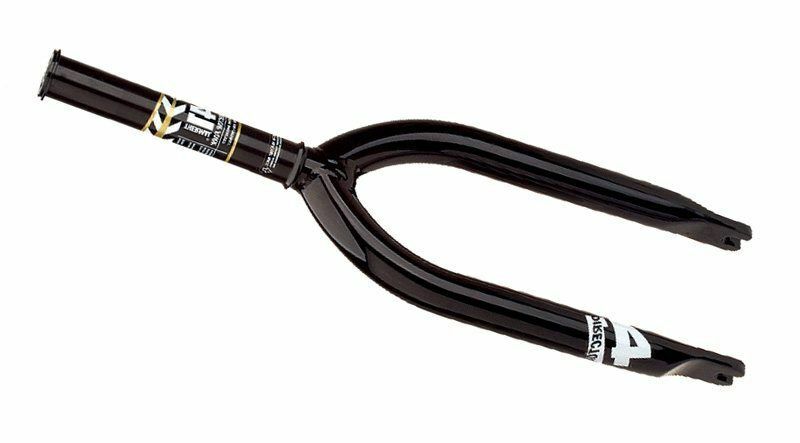 You may be reading the title of this article and thinking “Why do I have to worry about what forks I ride, they aren’t important.” but they are in fact a very important part of your BMX. The best BMX forks will keep your bike light, strong, stable and comfortable to ride. When shopping for new bike forks it becomes hard to mistake any differences between each model. 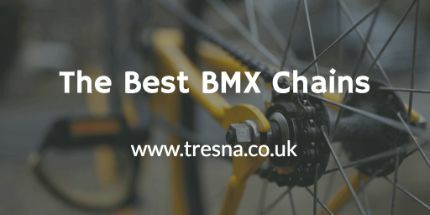 In the following list, you’ll start to see that BMX forks do take a lot of thought and work to get right. A dirt jump rider won’t be able to ride at his best if he’s using a flatland style fork. For this example, it’s because flatland riders like their forks to be right underneath their bars to make it easier for nose and spinning tricks. Dirt jump riders feel more stable and comfortable with larger angles. 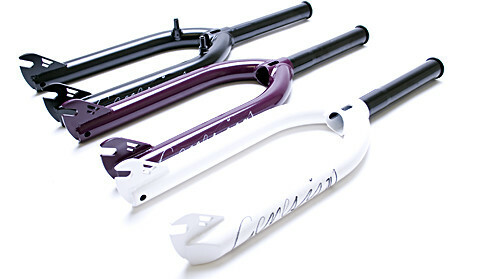 Most BMX forks are now being made from heat treated Chromoly. Despite this the thicknesses, lengths and the machining process are always vastly different, resulting in very different shapes and weights. 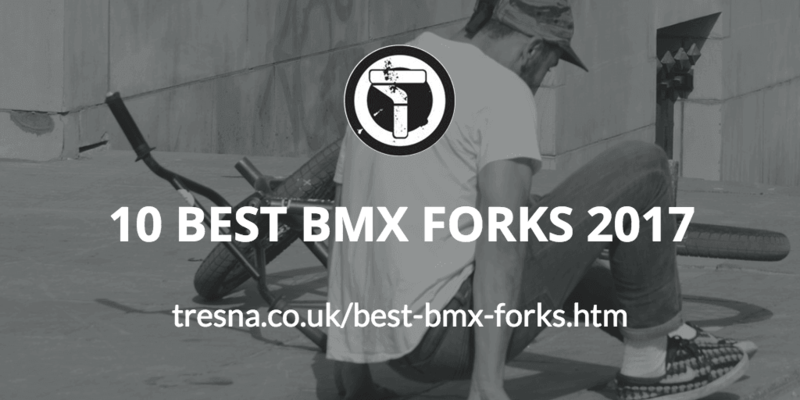 Fit bikes seem like a perfect way to start this top ten list of the best BMX forks. Fit is known for making some great bike parts although they only really concentrate on BMX parts. These forks are actually the third version in the series of Blade forks. Fit bikes have definitely put a lot of time, money and effort into this line of products. They originally set out with the goal of producing an extremely strong fork with a lot of tire clearance. If you’re wondering why you’d want extra tire clearance, it’s for riders that are likely to be riding on terrain that needs bigger tires or there’s a lot of dirt that can get stuck. Tire clearance is an important aspect for many dirt jump riders. After two years of effort and getting to their third version of the fork they have produced an outstanding piece of equipment with a 33mm offset and some other great features. Dropouts aren’t always considered an important part of the fork to develop although when you think about it they are the most important welds on the forks they are the only protruding metal from the forks and take a lot of force when landing heavy. Fit Bikes have thought extensively about this and have used left and right specific investment cast drop-outs. This is instead of traditional Cro-Mo plating that’s commonly used on other BMX forks. The engineers have also eliminated the weld gap on the inside of the drop-outs, this enabled them to thicken up the material towards the top, giving it even stronger and more reliable connection. The end of the fork legs is also now seamless without capped ends. Fit now form the legs instead of capping and welding them. This prevents fractures and cracks when riding. The steerer tube has been made longer, 166mm to be exact and it is also CNC machined. A 24mm x 1.5 integrated compression cap is now also used with a slightly thicker steerer tube. This has been thickened carefully as it is easy to add weight this way. Tapered and butted legs provide more strength than the other versions of the fork with a crown weld surface and more peg clearance. Snafu isn’t a very well known brand although they are making some solid products that more and more riders are starting to use. 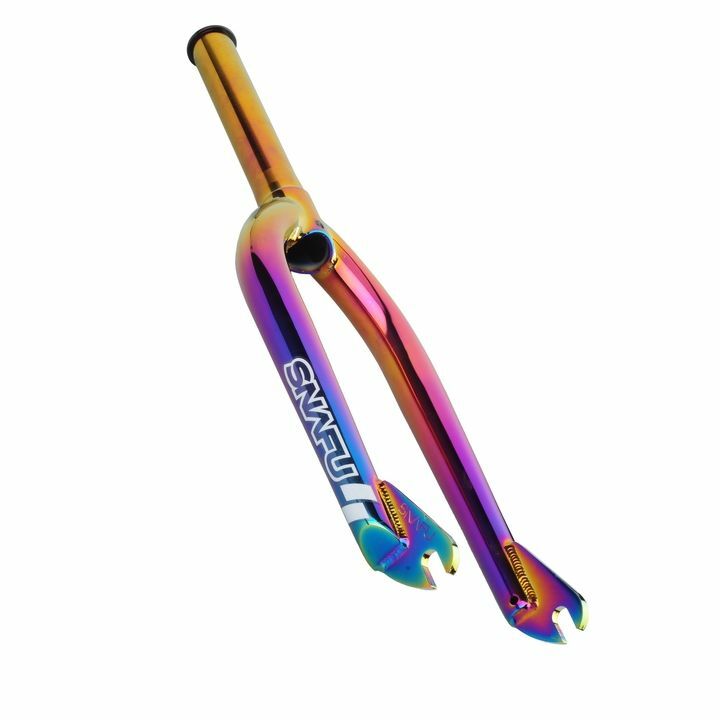 The Snafu 2.0 Race fork is made from heat treated Chromoly, which is quite a common material but is without a doubt one of the best materials to make BMX forks out of. It keeps the forks very strong but still keeps the weight off. Snafu has also used a machined reinforced steerer tube. These are both very good things to have on your forks.Being machined it makes the product much more accurate and obviously, the reinforced steerer tube is much stronger than normal even though it may be a little heavier. As you can probably tell from the name of these forks, they are built to be light and used for a more race style of riding. Weighing only 793 grams the Snafu forks are one of the lighter pairs in this list. While they are very light the forks are being sold at around £130 they are definitely a larger purchase than some other forks on our list. You probably didn’t need to read this sentence to realise the Director forks aren’t like most others out there. The dropouts are placed directly under the rest of the forks. This would generally mean that they would feel extremely weird to ride as the wheel would be in a completely different position and also at a different angle to normal but Odyssey has brilliantly raked the forks forward to give the feel of a normal bike with great rigidity. The Director forks aren’t as light as the brilliant Snafu’s but still extremely light, weighing only 890 grams. I think this makes these forks even better. They’re obviously very strong due to the fact that they use a lot less material than other forks. As you can also tell from the image above, the dropouts are much thicker than normal. The extra thickness coupled with the dropouts being formed straight into the legs eliminates any worry of bent dropouts from heavy riding. 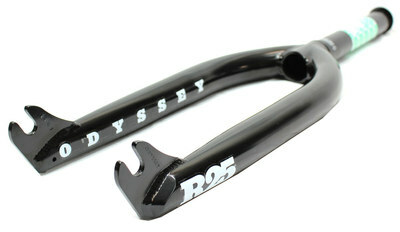 Odyssey started making their forks this way due to the high demand for new forks from professional riders. Bent steerer tubes or broken dropouts were plaguing the riders, with some needing new bike forks every couple of weeks. After Odyssey designed and developed the director fork that same rider now only replaces his forks yearly. 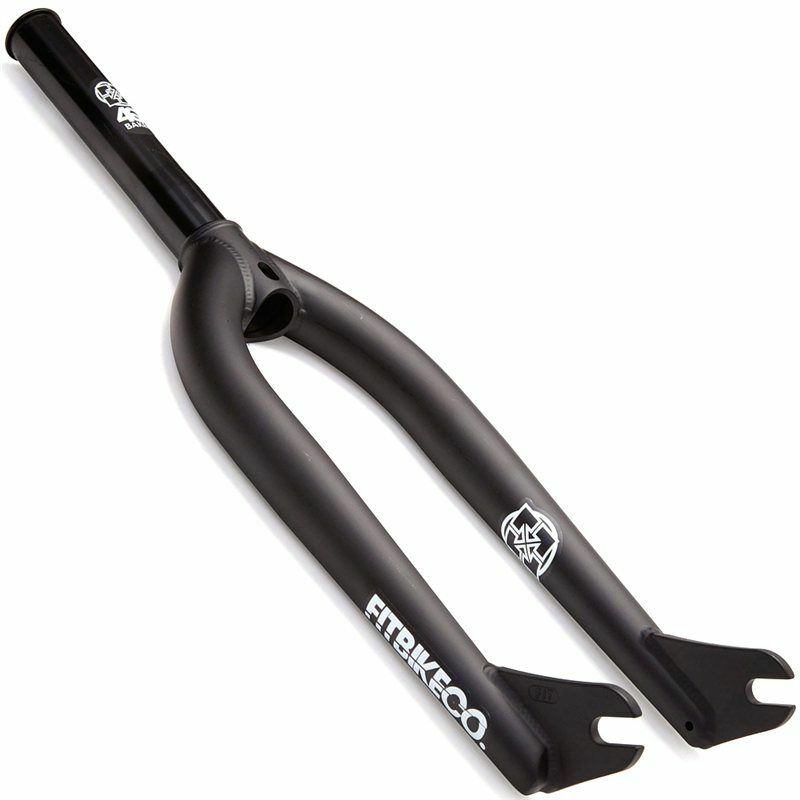 That’s a very good sign of a great BMX fork design. I have loved Primo parts for a while now. They are only getting more popular, especially when they make products as good as this one. Made from 100% Chromoly as usual, with 29mm tubing that flattens down to 17mm at the dropouts to keep them strong. 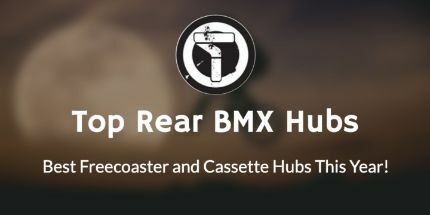 The dropouts are positioned at a pretty steep angle in comparison to other forks making them extremely responsive and perfect for flatland riding though many riders still have great reviews when riding them for other styles. I would suggest the Primo Strand 2’s will suit you well if you commonly ride street flatland and possibly park as well. I say this as the steep dropout angle makes them perfect for nose tricks and stalls while also making the bars spin a lot faster and easier. I think these are the besst bmx forks for street. I’ll be honest in saying that I haven’t really heard much about Volume bikes but after coming across the Genesis forks, I’ll definitely keep watching out for their new releases. These forks are light strong, comfortable and come with great geometry. The 75-degree tubes make them extremely comfortable to ride and you can feel a lot safer riding over larger jumps. Personally, I would be sceptical of the Genesis forks for the weight and positioning and thickness of the dropouts. The problem with the dropouts is that they are welded onto the forks instead of being formed. The weld is going to be much easier to crack or bend than other brands and this means too that Volume was limited to the thickness of the dropout they could use in order to keep a strong weld. Even the difference between the Genesis forks and the Primo Strand 2’s are 13mm and in my mind, the Primo’s would make me feel a lot safer. I believe the dropouts are slightly better than some others on the market due to them wrapping around from the front onto the bottom of the steerer tubes. They might be far from as good as the Odyssey Directors but the CS2 race forks are another highly recommended product. Let’s start off with a very good aspect. They are protected under Odyssey’s lifetime warranty. When a product comes with a lifetime warranty I gain a lot more confidence. The company is showing that they believe in their products so much that they are willing to lose some money if they don’t work properly. 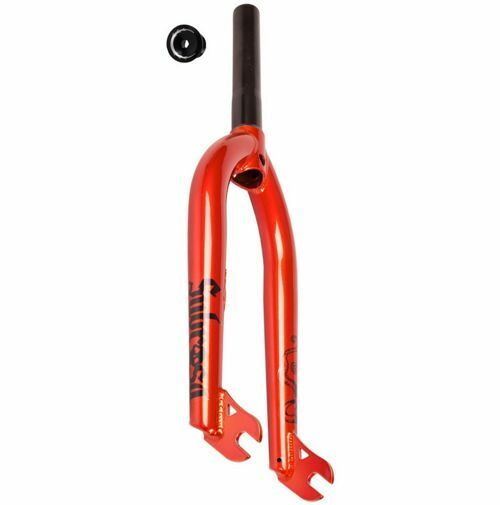 They also don’t come with an extortionate price tag like a lot of other BMX brands attach to their forks. Being sold at Source BMX for £95 I think that they are priced appropriately. Even though I’m put off by the welded dropouts I am very intrigued by the tapered and butted race legs as well as the whole steerer tube being custom machined out of a single piece of Chromoly. They have then fitted it with an integrated race headset. The dropouts are 4mm wide, which may make it weaker than some forks but is very optimal for peg riding. For anyone concerned about the technical specifications of the CS2 Race fork, they are as follows. Steerer Length: 165mm, Offset 32mm, Weight: 992 grams. I believe Demolition used to be a very popular brand in the BMX space. 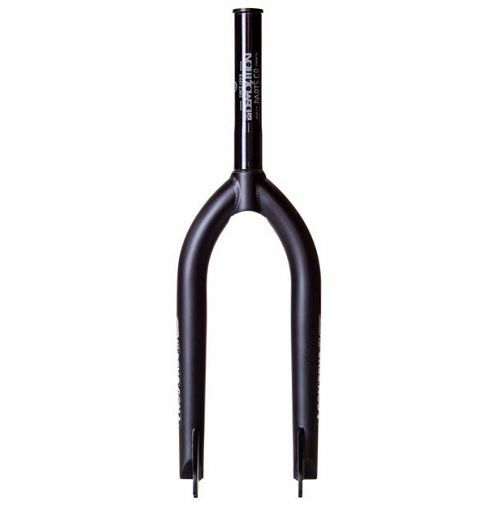 The Concorde fork, unfortunately now discontinued, show this. The Concorde fork was loved for its chunky shape, weight, strength and gorgeous paintwork. The paintwork on these forks is great. Really powerful colours with very thick layers that last a long time without chipping or fading. Demolition hasn’t tapered the ends of the forks, resulting in a lot of park and street riders reporting that they’re always hitting the bottom of the forks on ledges and rails. I should say that these are the views of people that have bought and ridden the Concorde forks. Demolition actually says there’s a slot on the forks for riding pegs. The Concorde forks are actually Chris Doyle’s signature fork. For anyone that’s seen his riding, you’ll know he’s not afraid of going big and putting his equipment through its paces. As far as I know, they hold up very well and haven’t given him any trouble. 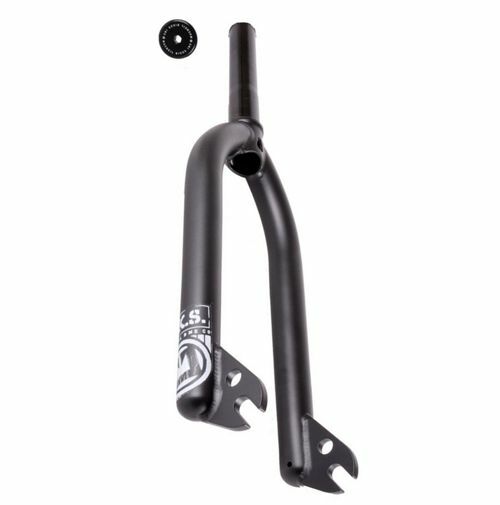 The following are the technical specifications of the Demolition Concorde Forks: One Piece Steerer, tapering at the crown, Offset: 32mm, Steerer Tube Length: 167mm, Dropout: 4mm, Weight: 899 grams. 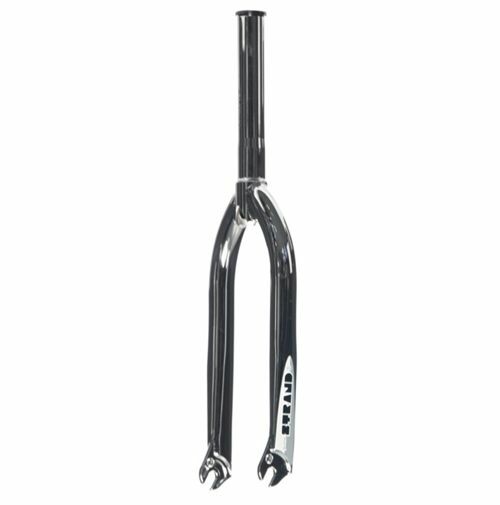 This is the Odyssey R25 BMX fork. They are one of the most expensive on this list and also one of the lightest (885g). Again they are made from 41-thermal processed Chromoly, just like most other forks. Built into the forks is a bearing race. 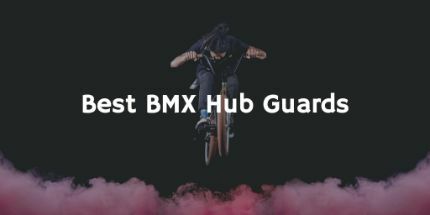 Having your bearings built in is often debated by all riders, there are obviously positives and negatives to both ways but always make sure you check before buying certain BMX parts. 4mm dropouts have been used again to make riding with pegs easier and less likely to damage the metal. 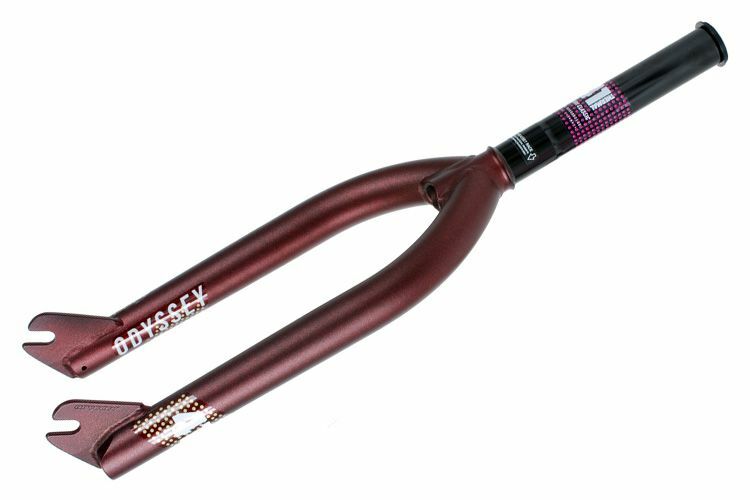 To eliminate the problem of scraping the bottom of your forks on ledges and rails, Odyssey has gone to the trouble of adding extra peg clearance with a seamless, tapered, butted and specifically formed leg tubes. To make the forks even more suited to park riding, the offset has been reduced by 7mm from the usual 32mm down to 25mm. This dimension has been changed to give the bike a steeper, more responsive feel. Perfect for nose and spinning tricks but will be tricky to control in a race or on dirt jumps. Again the R25’s are protected under Odyssey’s lifetime guarantee so it doesn’t matter how long you’ve had them, they will always be replaced. Odyssey is so confident with their products it makes them look a lot better. They have also laboratory tested these forks and eliminated any problems that those tests showed. If you can bare the price tag then these will definitely be some amazing forks to ride. Macneil has made a great fork here. They are much lighter than any of the forks above, weighing only 835 grams, that’s a full 50 less than the more expensive R25’s. They have thicker, stronger wall tubing and dropouts. An extended steerer tube is also featured on the Macneil CKS’s. To prevent corrosion, Macneil has dipped these forks and fully 20/20 heat treated them. As mentioned above, the steerer tube has been extended to 148mm. As I prefer, the headset is a fully integrated race headset. Many people don’t care too much about the top cap when buying new forks as I believe many riders just see it as a little necessary accessory. They do however pose an important role. To get enough compression without something slipping or breaking means it’s definitely a good idea to either look into your top cap make or buy a little better quality one. These forks come with a Custom aluminium pre-load bolt. Villicus forks are relatively new to the market. These are another set of great signature forks that were designed and ridden by Hoang Tran. There are a few things I like and a few I dislike about this fork. I’m not a huge fan of the welded dropouts but Subrosa has used great geometry and lengths to make them ride great. The forks are also coated with ED coating that prevents rust, one of the most annoying problems riders have. 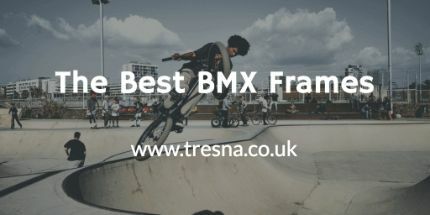 If you haven’t already noticed from their prominence on this list, Odyssey BMX make some amazing forks. The R-25 and R-32 editions are some of the most popular and disputed forks by Odyssey. If you’re a beginner or intermediate rider, these two forks are similar enough not to matter. The R25’s are designed perfectly for street, flatland and park riding. The steeper 25mm offset length makes the riding feel much more ‘twitchy’ and steering will be quicker, resulting in a bike that’s a little harder to control. This is why these forks shouldn’t be used in riding that includes a lot of speed like dirt riding. Tricks like front-end stalls and nose manuals will be easier to get into and stay in while using these forks. If you’re a newer rider or one that isn’t solely dedicated to riding flatland or park then I would recommend the R32’s; as written about in the next paragraph. 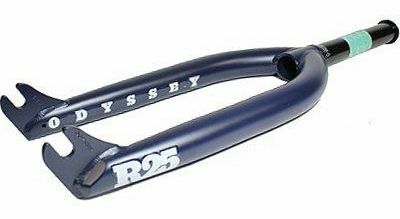 The Odyssey R-32 2018 forks are an industry standard for newer or more diverse riders. The 32mm offset is less steep than most forks solely dedicated to one riding style. The steering will be easier to control than steep forks. This head tube angle will give you a much more relaxed feel, perfect for people who like to ride trails or dirt parks. Made from Odyssey’s regular 41-thermal processed 4130 Chromoly, featuring a built-in bearing race, 4mm dropouts shaped to embrace grinding and peg clearance. The seamless, tapered, butted and specially formed leg tube is another method of adding peg clearance and preventing grinding scrapes. Odyssey’s properly designed and tested products often outperform others on the market whilst also being lighter and stronger. They are a little heavier than some of the other forks, weighing in at 878 grams. They are still relatively light and also very responsive.